This post is about a great recipe. It’s also about the possibility of re-invention. 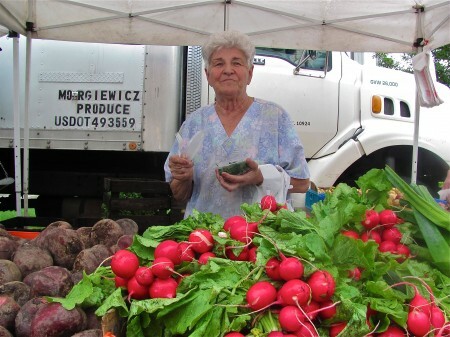 The story begins with Sophie Morgiewicz, 71, the widowed matriarch of Morgiewiecz Farms in upstate Goshen, N.Y.
Sophie and her three sons grow tons of vegetables on their 170-acre property, which has been in the family for five generations. Every Saturday, they drive down from their home in the Hudson Valley’s legendary Black Dirt region to my local farmers market in Hastings-on-Hudson, N.Y. I’m always there on Saturday’s too, browsing their splendid array of leafy greens, squashes and root vegetables. But then, Irene put their farm underwater and destroyed much of their harvest. After the storm, the family showed up with potatoes, beets and only a few other hardy items. A heartbreaking sight. Now, a month later, things seem better. Mesclun is back. The cucumbers and kombucha squash are terrific. And there are plenty of radishes, a fast-growing crop that’s sold by the bunch. Sophie says that most radish customers ask her to twist off the green tops, which she throws away. A few weeks ago, I asked her to save them for me. Guess what — she’d NEVER eaten them, not even once. But this past Saturday, I cooked some for her. She took a bite. Then another. Plenty of people would agree. Radish greens are lush. Google “recipes for radish greens” to read the raves for the robust color, texture and flavor of these under-appreciated veggies. You’ll also read many laments over the difficulty in getting your hands on enough of this flavor-packed, nutrient-dense treasure. Those who manage to amass enough leaves have a number of choices in the kitchen. Western chefs veer toward the basic saute-in-butter or a puree for cream-based soups. And while Asian cultures cook and pickle all types of radish, it seems that only the Chinese are really known for loving the leaves. Beyond taste, there’s an outstanding nutritional profile. These calcium-rich greens with anti-cancer properties deliver six times more Vitamin C than the actual radishes, according to EveryNutrient.com. 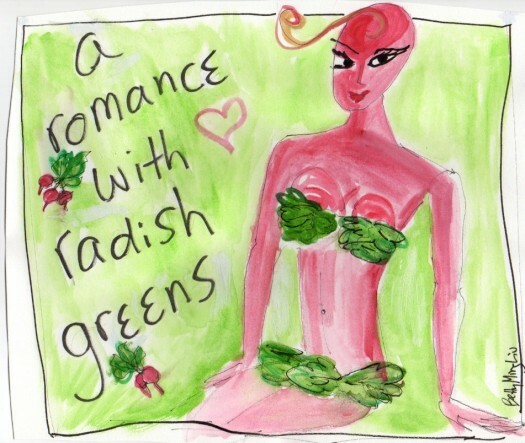 Chinese herbal medicine values radish greens as an aid for circulation and digestion. They are effective at breaking up mucus, phlegm and edema, says expert Jeffrey Yuen, who is a good friend. He adds that someone my size — 5’4″ and 125 pounds — could benefit from half a cup of cooked radish greens a day while the crop is in season. Prep radish greens just the way you would spinach (even though the taste and texture are different). A few rinses are necessary. Chop the leaves. Or, not. Cooking can be as simple as a saute with some olive oil or butter in a hot pan, over a medium flame. Wilting them is good enough. Or for a smoother chew, cook for 10 minutes, either covered or uncovered. To take down the pungency, a splash of Bragg Liquid Aminos will do the job. The sturdy leaves are thicker and more chewy than spinach. They are also more spicy and bitter. Based on my initial experiments, they seem to be a delightful yet assertive team player with other ingredients. Check out the trio of photos below. I start out by chopping, then stir-frying with sliced radishes, mushrooms, wood ears (a tree fungus) and ground pork. This dish is seasoned with olive oil and Bragg Liquid Aminos — a great, gluten-free, alcohol-free, sugar-free substitute for soy sauce that also works well in non-Asian dishes. It’s served here with quinoa. Yum. Btw, cooked radishes are very nice too. So what should Sophie and her family do with their wonderful trash? Hmmm. Let’s say a one-pound bunch of radishes sells for $1.50. Two-thirds of that sale is radish. The other third is leaves. Sophie wanted to give me the greens for free. I insisted on paying $2 per pound. Honestly? If the leaves were unbruised (cut off at the stem instead of twisted off), I’d be happy to pay $2.50 per pound. This is my doodle of a radish. She’s hot, haha! P.S. – Update at 11 a.m.: I’m getting a few personal emails asking about dietary/energetic use of radish greens. So let me just post it here. My Chinese medicine go-to guy, Jeffrey, says that radish greens are classified as sweet, spicy and warming. They can get things moving in your system and help with cleaning out liver/blood issues. That’s why they’re good for stimulating circulation. And if you tend to feel cold, eating them in season will be pleasantly warming. If you’d like to check out more of my food stuff, just go HERE. 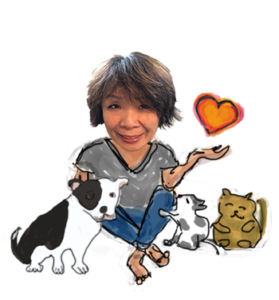 Update, June 14, 2014: Thank you all for making this one of my most popular blog posts! Just thought you’d like to know that shortly after this post ran, Sophie’s customers started keeping the tops. Btw, Sophie’s stand just opened again today for the start of the 2014 season. Of course, I bought a beautiful bunch of radish greens. Welcome back, Sophie! Wow, I am making radish greens today. Very inspiring. For years I’ve been composting the greens and focusing only on the radishes. Thank you!! Thanks for sharing – I am a home gardener, and radishes are probably the easiest thing to grow. I was just never that fond of them, but now I will grow them for the greens instead of the bulbs! we all have been focusing on the radishes! and we only use them as decoration in salads, right? 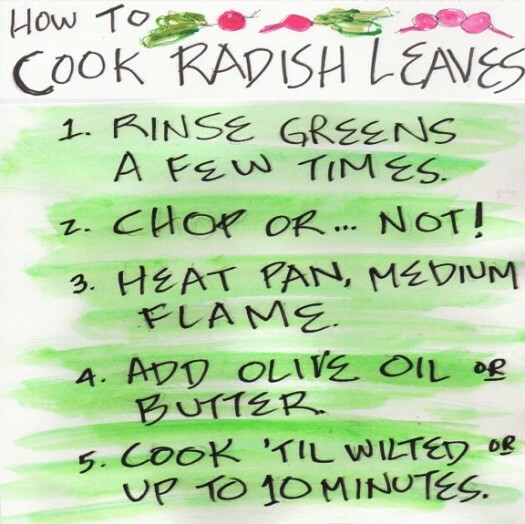 i recently cooked the radish and leaves separately and then combined them together as a pretty, tasty side dish. i can’t believe what we’ve been missing all these years! another thing — in reading online about radish, many stories say that they grow to maturity in three weeks. isn’t that really fast? and doesn’t that mean a lot of trashed greens? and couldn’t these greens become an incredible specialty item for the gourmet market? what if the radish were sold at something like half a pound per pre-packaged brown paper bag? there’s another farmer at the market who sells $5, one-pound bags of cremini mushrooms. he doesn’t have to weigh anything so it’s an easy, quick transaction for both buyer and seller. I eat both the radish and the greens raw in salad or cooked. They are very versatile. I would pay between $1.50 to $2.00 per lb. for the greens. In NYC Chinatown every once in awhile I can find immature daikon with tender greens for sale at about $1.50 a lb. They are wonderful for stir-fry and bun stuffing. At farmer’s market I do have to buy about three bunches of red globe radishes to get enough greens for a stir-fry. But like Betty suggested the radishes can be in other ways as salad or side dish. I sometime flash pickle the radishes in a sweet and sour brine as a cold dish in a Chinese meal. The problem with packaging radish greens is that they deteriorate very quickly. So it is difficult to market the greens separately without having large spoilage problem. In fact I would suggest buying radishes with greens attached then immediately used them when you get home. Cut off greens usually don’t last very long. What a sweet post. So cute of you to cook some greens to share with Sophie. Yes – leafy greens are nutritious and delicious. I love the resourcefulness behind Chinese cooking. Ah, so wonderful to see you interacting with radish greens! I’m going to share this recipe with my boyfriend as he is in love with quinoa at the moment. The best part is to hear how you shared your knowledge with Sophie Morgiewicz, your farmer – you’re a budding female farmer yourself! I say this because pre-industrialization, rural women relied on feminine, intimate social networks (just like the one you have with Sophie) to not only survive in rural America, but to thrive and exchange knowledge. In taking those greens home and then bringing them back to Sophie in a new way, you are doing exactly what our foremothers did on their farms before us! And you’ve even fostered a creative way for Sophie to make some more money, prevent waste, and recover from Hurricane Irene. Bravo! :-) Also, Sophie is very lucky to have recovered seamlessly from Irene; it’s refreshing to hear some relatively good news come from that agricultural disaster. you know, there’s a real echo quality to blogging. after i put something up here on the website, it kinda takes on its own life in my life. and madeline, this idea of resourcefulness reminds me of my dad. his parents were poor farming folk in southern china. they immigrated to south vietnam. he grew up in what was then saigon. my dad used to guilt me into eating my veggies with poverty stories. his favorite one was about his family being so poor that his mom would send him to the local cemetery to pick weeds that she would cook for their dinner. sound familiar? and steph, thanks for your insights! i’ve learned so much from your blog, http://legumeloyalist.com/. everyone, stephanie is one of my former nyu undergraduate journalism majors. she’s graduating any day now. her dream is to be a female farmer. the new feminism. fascinating. btw, one of my st. johns students is from the goshen area. she takes issue with the description of her hometown being described as “upstate.” well, she’s right. it’s actually in the hudson valley, which is hardly upstate. You, ma’am, are the bane of true sustainability, you insufferable yuppie foodie. Seriously, I appreciate that you stopped by to comment. I also feel it’s important to pay the farmers for their labor, even it’s a little pricey. Naturally, I came upon this just after discarding the wilted and soggy radish greens that I had kept in the hopes of figuring out what to do with them! next time, though, they’ll be saute’d and served over pasta. Barbara, there’s always next time! Btw, after I did this post, the farmer stopped giving me discarded radish greens because…everyone who bought radishes decided to keep the tops! I am growing radishes for the first time this year, so was curious whether I could use the greens. I’m anxious to try. They just started sprouting yesterday. Garden Lily, I think you’ll possibly LOVE the greens. I envy the fact that you will pick them right out of your garden! Just one word of caution…the greens rot really quickly. They will not keep long. Based on my experience, they start to go bad after only a few days. But if you eat them right away, they are heaven! With the help of a PVC hothouse that starts veggies in March, we are on our second planting of radishes and the tops are huge. Now to figure out how to can the way my mother used to. Huge tops? I’m so jealous! And pickled radish greens, mmmm. When do you invite us over? If you ever figure this out, and feel inclined to stop by, would love for you to give us an update. Thanks for visiting! I ended up with greens from my farmer’s market radishes and found your blog while searching for ideas on how to use them. I cant wait for dinner tomorrow! Penny, thanks for stopping by and taking the time to drop me a line. Hope you had a fab dinner!